In 2015 female musicians have been responsible for the release of some of the finest albums around, creating music in a variety of genres that’s at least as good, if not better than their male counterparts. So why is it that they only ever seem to get compared to each other? The last time we checked female wasn’t a genre! So why is every woman with a guitar compared to PJ Harvey? We must admit we’re as guilty as most music reviewers of going for the easy comparison, it’s not easy to get out of the habit of hearing a female vocal and thinking which other woman does this sound like. So Natalie Prass sounds like Caitlin Rose, Waxahatchee sounds like Angel Olsen and Joanna Gruesome sound like Bikini Kill right? Well, no because beyond the vocal is a musical accompaniment influenced by everything they’ve ever listened to, and shockingly some of that music was probably made by men! So you can hear the Americana of Ryan Adams in Natalie Prass’ output, the open-hearted, confessional styling of Waxahatchee owe as much to Bright Eyes as they do Sharon Van Etten, and Joanna Gruesome are influenced by punk bands of all varieties, not just those who wore the Riot Grrrl label with pride. Back in 2013 Nadine Shah released her debut album, Love Your Dum And Mad, it introduced the listener to the dark, and somewhat gothic world she had created. It was full of grandiose piano playing, swooping, jazz-tinged vocals and song after song about love in all its gory, dark details. It was like being enveloped into a particularly beautiful black cloud, with only the briefest moments where you saw the merest hint of the light. It garnered plenty of critical acclaim, and rightly so, but with its long gestation period, by the time the album arrived into the world Nadine was already moving on, her sound developing so rapidly it was leaving her recorded material behind. Returning with her new album Fast Food, the development of her sound is clearly displayed even from the opening bars of the title track that beings it. Gone are the sparse piano arrangements of her previous work, replaced by the dark, almost swampy stomp of drums, and bright, searing guitars. The whole track has a feeling of tension, and via lines likes “our guts are rotting” there’s a general feel of unease and almost repulsion. The lyrical themes of a place haunted by memories are similar to those championed previously by Ryan Adams on his heartbroken master-piece Love Is Hell and the line “an empty house is full of memories that scare the crap out of me” certainly wouldn’t have sounded out of place on his work. As an album the mood rarely steps out of the claustrophobic and dense production, and the obvious reference point is the work of Interpol; she occupies a similarly uncomfortable sonic ground. Working with producer Ben Hillier, the soundscapes crafted are more about overlying feelings than details, so the bass rumbles ominously, drums pound rapidly and guitars are high-end pulses of sound. Throughout the album there’s scant moments of relief from the feelings of anxiety. A point that’s also mirrored in the lyrics, which rarely step out the deep tension of a relationship, be it failed or failing. If the album has a weakness it’s the lack of contrast offered to the listener, by the time Washed Up comes in with its insistent guitars towards the end of the album and she’s pleading with someone to “tell her that you love her and see it as a defeat” or Nadine’s embracing her piano playing tendencies on Big Hands, it’s hard to escape the fact that you’ve not really moved on from the same territory explored elsewhere. Whilst the repeated moods and sonic palette give the album a coherent feel, it could unquestionably do with a bit more light and shade. Especially with the last quarter of the album just not being as strong as the opening salvo which includes most of the albums big hitters. At her strongest she remains blessed with not just a stunning voice but also a fine songwriting mind, never better expressed than on the excellent single Fool. Over a web of interweaving guitar lines, a low bassy rumbling and drums thrashing out a heavy, steady beat, Nadine emotes the tale of a man who’s predictable nature drives her to be critical even beyond her own sense of reason. It’s the album at its most acidic, a bitter, menacing character assassination, underpinned by a wry sense of humour and a lightness of touch. She accuses the man in question of fashioning “words that fools lap up and call yourself a poet” before pointing out how predictable he is, as she notes “I guessed your favourites one by one and oh to your surprise from damn Nick Cave to Kerouac they stand their side by side.” Shah’s been quick to point out Nick Cave and Jack Kerouac are her favourite musician and poet respectively, but the songs reflects the absurd things love makes us do, when it allows us to become so angered by someone that even the things we admire become sticks to beat them with. The rage builds but it becomes clear that this is an anger at one that has already passed on to another, as Nadine sings “let the other girl, indulge the crap that you excrete” it’s fair to say he’s not on her Christmas card list! Divided pairs a repeated acoustic guitar riff with the distant sound of toms, it’s written not unlike a Bill Callahan track, whilst the production has something of Joy Division about it. Lyrically, it explores the fear of opening up and her concerns as she sings “I showed you my worst” at times she almost seems to be pleading with her lover to leave, noting “I didn’t ask you to need me, I never begged you please stay.” It’s a stark contrast to the optimism and genuine loving feelings of the opening lines “my love it was divided between his cheek bones and his knees” has a real sense of romance, but there’s always a fear of loosing oneself into committing to another, summarised here via something as seemingly unimportant as a hair style, “I let my hair my loose for you, but I would scrape it back as soon as I would leave.” It’s a beautifully down beat and reflective piece of song-writing, the music a gentle wash that perfectly compliments the excellent lyricism on show, at the end as she pleads “now you should be gone dear, go away from me” even as a listener you’re questioning if she’s not letting her own self doubt get in the way of her own happiness. The albums only major detour comes in the shape of Nothing Else To Do, it’s a minimal, lilting number, all walking strings, gentle percussion and multi-tracked vocals, rolling out the tracks only lyric, over and over, “And there was nothing else to do but fall in love.” There are shades of the work of fellow North-Easterners Paul Smith and Peter Brewis’ recent Frozen By Sight Project to the intro, but by the time the lyrics fade and a gentle, beautiful horn section kicks in we’re closer to the arena-filling indie perfected by Elbow. The albums lead single Stealing Cars is a revealing snap shot of vulnerability, over pounding drums and scratchy electric guitars Nadine sings of a man who would make her feel he had left her at her weakest and most alone, “take the covers from me, naked for all to see, you handed me over.” A rare sighting of her piano playing adds a beautiful melodic embellishment to the outro, their effectiveness enhanced by their sparsity. Fast Food sounds like exactly the album Nadine Shah wanted, and perhaps needed to write. It’s a re-imagining of a sound she hadn’t entirely mastered on her previous records. It’s a record that emphasises her qualities as a songwriter, and one that undeniably includes the finest songs of her career to date. At times is utterly thrilling, urgent guitars, heartfelt and honest lyricism and her voice remains undeniably beautiful. It fades from a high but it remains a fine album, whilst leaving her room to continue her growth, you’re left feeling that the next Nadine Shah album could be even better, never a bad thing! Fast Blood is out now on Apollo Records. 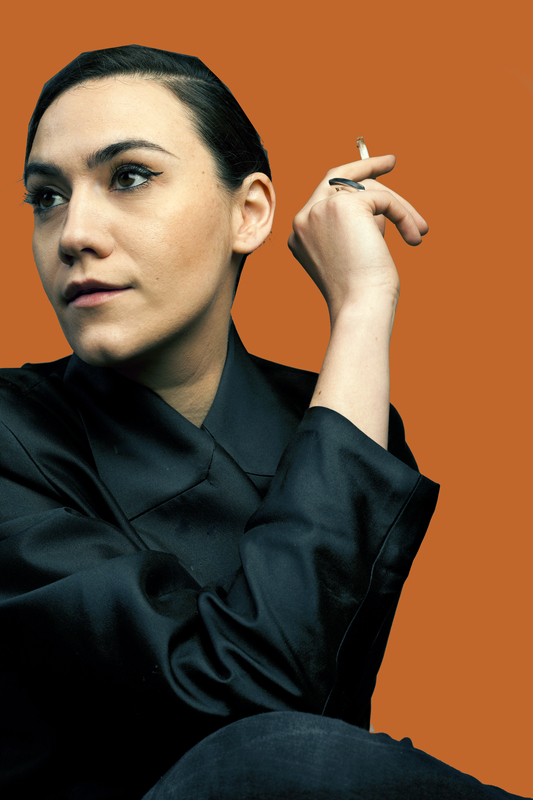 Nadine Shah tours the UK throughout April and has recently announced a show at London’s Union Chapel in October.